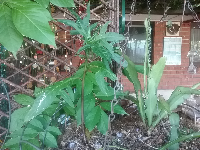 This has started growing in a hanging basket, next to an epiphyllum. Is it a plant or a weed? 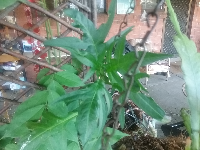 I"m pretty sure it"s a weed, at least I hope so because I always pull these up in my own garden! Is that spines on the leaf tips? Try Solanaceae, either Solanum or Datura sp. I forget what it grows into because I don"t allow it to mature. Hi, thankyou. There are no spines on this plant. It is nestled in the middle of wisteria on the left and the epi to the right. Looks very much like Solanum laciniatum. Thankyou for your help, Now do you grow them or pull "em up? Comment on "Unknown plant, anyone know?"